Home » Chewy » Dollah Dollah Bill Y’all! There I was, strolling through Rite-Aid after taking the boy out for a burger with Mrs. J Guru, minding my business. Somehow we made our way to the candy aisle, and there it was. The “theater-sized” candy box sale. 2 for 2 bucks. Not bad at all. All the uszhe suspects were there- Hot Tamales, Milk Duds, Whoppers, Good & Plentys, Mike & Ike’s, etc. As I’m reaching for the dud and the whop, I stop myself-I should be buying candy, duh. Of course. But I should be buying candy I haven’t tried, right? Trying new things for YOU. My peeps. It’s like there’s Jesus, then Oprah, then the Candy Gurus. That’s how much we give. Hmm. Total crap shoot. They look like they could be interesting- maybe a tart, hard coin shaped gummy, that when I’m done with one, rivals even the best candy manufacturers of Germany??? But…they also look like they could be a hot mess. So I bought. They don’t look like coins. But as I opened the box, I kinda got the feeling that the color was the least of my worries. Like a frightened dog, I carefully sniffed the inside of the box. Nothing. Zero. It could have been a box of ink cartridges, it’d have smelled the same. Massive point reduction right off the bat. Then…well, …it was a real fast downhill ride. Remember JuJyfruits? 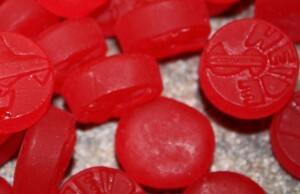 Big, soft, yet incredibly sticky bland candies from the dark ages? Imagine these as the flavor that got rejected when they made them. Raspberry? Please. Don’t call your flavor raspberry unless’n it’s got flavor-sweet and tart. That’s what raspberries are. 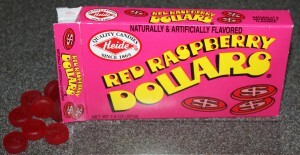 When your candy is mildy sweet, tasting of red, it aint a rasp. After that bummer is realized, the stick start. They start sticking. And sticking. And…gnarling in your mouth. Thanks for nothing, curiosity. But hey, it’s another one down, many millions to go. Tasting bad candy aint that bad. This is totally a q-tip candy.